Scotties, like most terriers, are alert, quick and feisty, maybe even more so than other terriers. They are independent, self-assured, playful, and intelligent. They've even earned the nickname 'Diehard' because of their rugged nature and endless determination. They are especially loyal to their owners, even compared with other dogs. 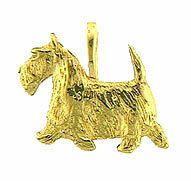 Keep your friend close to your heart with this pendant showing your Scottie in its most distinctive profile. Ideal for a necklace, lapel pin or tie tack.